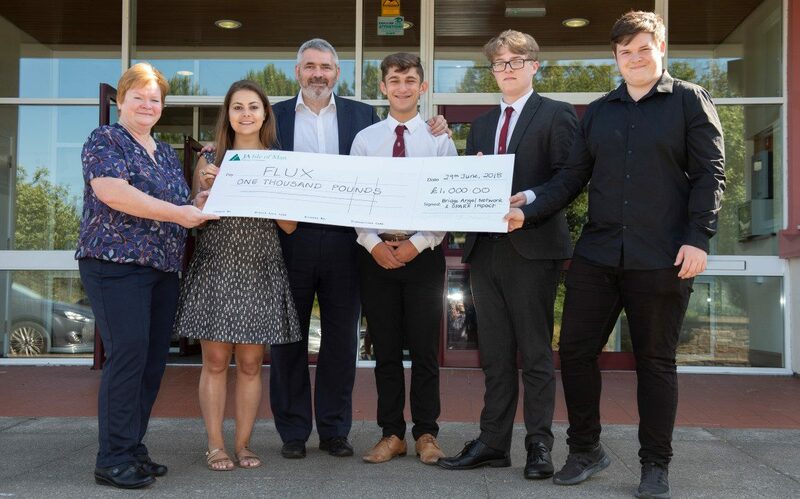 Flux, the student team from Queen Elizabeth II High School who took third place in Junior Achievement’s Company of the Year competition in March, have won first prize in the Pitch It! contest at ISLEXPO 2018. The team – Calum Dentith, Juan Gill, Andrew Gomershall, Nathan Hamer, Mikey Makin and Tom Randall – emerged top out of six finalists after presenting their business idea, Affinity, a wireless charger, to a panel of investors and entrepreneurs and a live audience. Their prize was £1000 in cash sponsored by Bridge Angel Network and SPARK Impact, a business mentorship from contest organisers Bridge Angel Network and two months’ free membership to Barclays Eagle Lab, the new community co-working space in Victoria Street, Douglas. Picture left to right: Sue Cook (Junior Achievement), Katie Nicholson (Bridge Angel Network), John Garland (SPARK Impact) – Callum Dentith, Mikey Makin and Andrew Gomersall from Flux.